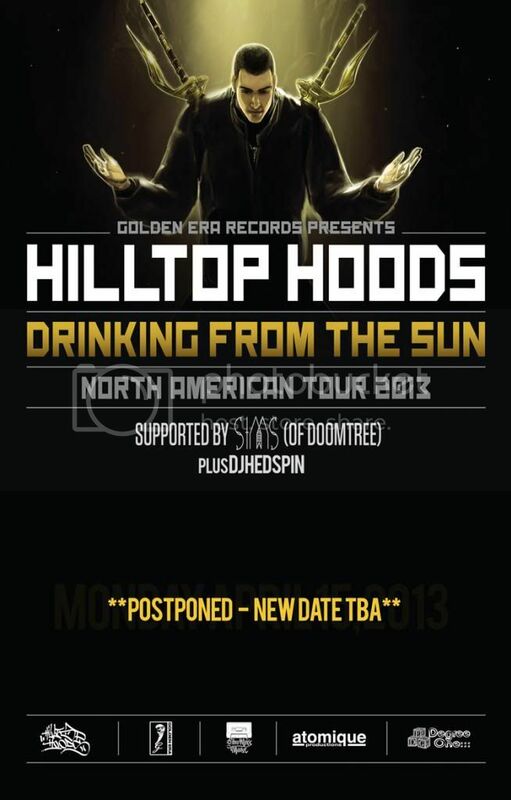 Hilltop Hoods formed when MC’s Suffa and Pressure met at high school in the Hills of Adelaide, South Australia. Later introduced by a mutual friend to DJ Debris, the trio found common ground with their love of Hip Hop. While Hilltop Hoods have drawn on a broad range of influences, they have never lost touch with the unique flavour they created in the Adelaide Hills as young Hip Hop fans. With an ethos that is both innovative and fearless, Hilltop Hoods inspirational sound has been embraced far beyond Hip Hop’s loyal underground. When the heads of rock fans, dance music devotees and even casual radio listeners nod in unison to the Hoods’ infectious beats there’s no doubt that the guys are at the top of their game. Hilltop Hoods further cemented their name with their next hugely successful album ‘The Hard Road’ (2006), which debuted at #1 on the ARIA album chart and went on to become the group’s second platinum album. After winning two ARIA Awards in 2006, five tracks from ‘The Hard Road’ earned spots in Triple J’s annual Hottest 100 and the group were awarded with the coveted J Award for 2006. Later the Hoods’ reworked ‘The Hard Road’ with the assistance of composer Jamie Messenger to create ‘The Hard Road Restrung’, incorporating the 31-piece Adelaide Symphony Orchestra. ‘The Hard Road Restrung’ went on to go Gold and take home the 2007 ARIA Award for Best Urban Release. Numerous sold-out national tours and standout festival appearances has seen Hilltop Hoods singled out as one of Australia’s most vibrant live acts by press, industry insiders and fans alike. Their success has not been limited to Australia though; the Hoods’ have proven they can take their sound to the far corners of the globe. They’ve toured everywhere from Switzerland to South Korea, appearing at such festivals as Glastonbury, Splendour In The Grass, Oxygen, Open Air Lumnezia, Splash and have spent years grinding out acclaimed headline tours all over the world. The group have continued to move forward at light speed without ever looking back, and their latest album ‘Drinking From the Sun’ is no exception. The first single ‘I Love It’ featuring the mesmerising vocal talents of Sia was their biggest single ever (their first to go triple platinum). The band launched ‘I Love It’ in Australia by supporting Eminem at three massive stadium concerts. Upon it’s release (March 2012) ‘Drinking From the Sun’ became the groups third consecutive #1 album and held its position for 2 weeks, taking the top spot from Adele. ‘Drinking From the Sun’ went gold on the day of its release and was certified platinum within one week. With all these exceptional accolades, Hilltop Hoods have not only risen to the top of Australian Hip Hop, but have cemented themselves a place at the very forefront of the Australian Music Industry. Hilltop Hoods have stayed true to their music and retained their integrity in an industry that has a tendency to value the transient.